Located on our doorstep is one of Scotland’s very few free public golf courses! Beautifully maintained by Edinburgh City Council’s local green keeper, the Bruntsfield Links boasts a fantastic spot of suburban greenery. With views of the volcanic Arthur’s Seat and Craggs, you’d be forgiven for forgetting you’re in the heart of Scotland’s bustling capital city. 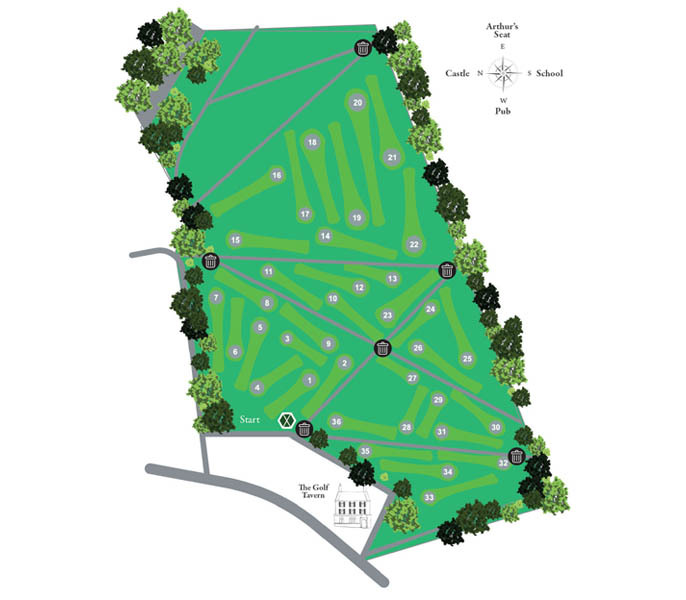 This short hole course is enjoyable for pro and novice alike. Club hire and score cards are available to rent from The Golf Tavern, so even if you’re just visiting you’ve no excuse not to get in a quick 36 holes. Here at the Golf Tavern, we love to give you a fantastic experience when you visit us. We are proud of our history and as the oldest clubhouse in the world we’re here to cater for all your golfing needs! This ancient watering hole offers the best in Scottish pub grub with a hearty selection of dishes so you can fill up before you start your round!